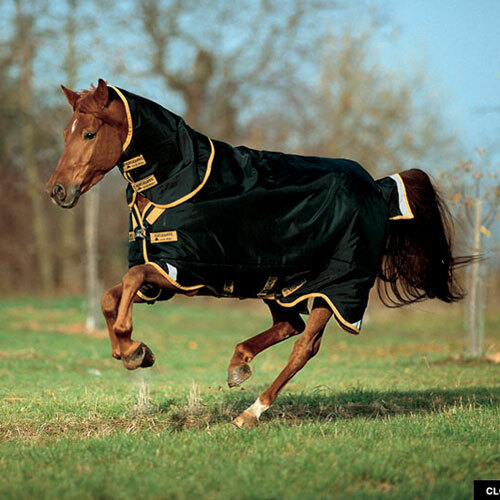 The Horseware Rambo Supreme Turnout Horse Blanket or Sheet is absolutely the BEST your horse can get! Rambo horse turnouts offer extra protection, where your horse needs it. The innovative Rambo Supreme horse turnout combines classic Rambo Original cut with Horseware’s patented Wug “V” formation front closure system. A REMOVABLE HOOD gives increased flexibility, allowing you to adjust the level of coverage according to changing weather conditions. Rambo LEG ARCHES™ & 3rd SURCINGLE allow the extra depth of the rug to contour to the horse’s shape without restricting movement. The new NECK DESIGN accommodates all shapes and sizes and will give your horse the best possible fit possible. These blankets have a 3 year guarantee on waterproof and breathability. No other company can give you that or the time-tested quality of Rambo Turnouts. Not only do they stand behind their Rambo Horse and Pony Turnouts, but the world's top riders in every discipline do as well. These turnout blankets are made of ballistic nylon. They won't slip, won't rub and most importantly will keep your horse comfortable. The nylon lining polishes your horse's coat and save time spent grooming. Available in Lite Weight (no fill) or Medium Weight (200g fill). Medium weight is Black/Black and Lite weight is Black/Gold.